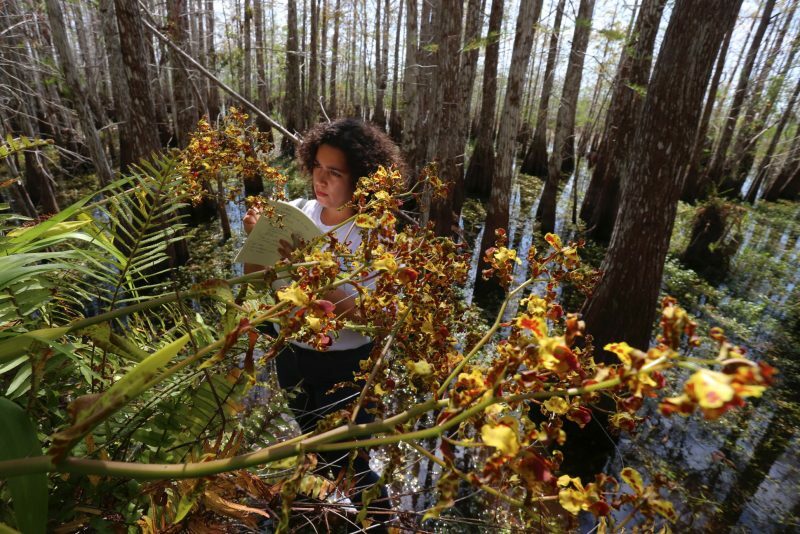 Ph.D. student Haydee Borrero studying orchids in Everglades National Park. FIU researchers have for the first time found fly larvae that feast on the rare Mule Ear Orchid in Cuba, giving them another way to gauge the effect of climate change. It’s no surprise that this particular fly was found on a tropical island home to the largest numbers of the orchid. Insects and seeds make long journeys carried aloft by strong winds and it is likely that the fly has been in Cuba for a long time. The benefit of knowing the fly is there is that researchers have a way of anticipating what will happen to the flies and Mule Ear Orchids that have made their home in the salt marshes of Florida’s Everglades National Park. As the climate continues to change, so could the flowering time of the orchid. Flies might miss their chance to lay their eggs in the plant’s stalks, leading to a boom in the number of orchids. As Borrero has found with Hurricane Irma, strong storms might even change the interactions between the fly and orchid. Further climate change might point to more Mule Ear Orchids thriving not just in South Florida, but elsewhere in the state.